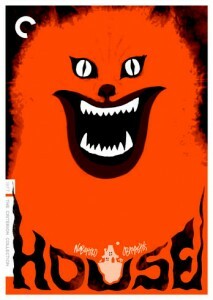 Japanese filmmaker Nobuhiko Obayashi’s 1977 film House was just introduced to me yesterday via Criterion’s new Blu-ray and DVD release. Though it wasn’t on my initial slate for review, watching it last night has more than inspired me to give it a few words as we approach Halloween on Sunday. 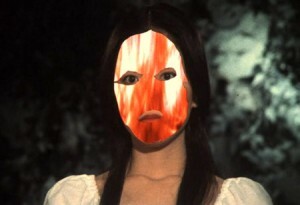 And that’s because this fantasy-horror-musical-experimental movie is just flat-out crazy. And, for those looking for a late-night flick on Halloween, House is a midnight movie of the first order. Though the narrative follows the classic slasher-stalking-nubile-girls-in-terror template, that plot description doesn’t tell the whole story for this movie. Here goes: Their summer vacation plans cancelled, school girl Oshare (Kimiko Ikegami) and her five girlfriends head out to her aunt’s mansion in the country. Once there, the girls are plagued by nightmarish visions and then, one by one, are killed in a series of nasty ways, as Oshare’s wheelchair-bound aunt begins to cackle. It’s Obayashi’s delirious, fantastical approach to what we’re seeing and hearing that elevates House to insane heights of cult-favorite status and enjoyment. Animation, colored filtering, blurry film, inexplicable fades, split-screens, artificial backdrops, off-beat editing, musical cues, funny/horrifying bits of violence and gore — the film is simply all over the place, proceeding solely on Obayashi’s whim and devices. The filmmaker creates a nearly indescribable busting-and-blending of styles within horror, which is usually the most traditional of genres. A girl being eaten by a piano, a white kitty grinning at a decapitated head, projectile vomiting — you really have to see it to believe it. The generous special features trove on this DVD includes a 1966 experimental film by Obayashi (it’s quite striking!) and a new making-of featurette that delves into the state of the Japanese film industry in the 1970s, when Obayashi was contracted to make what the producers thought was going to be a routine horror film with House. Man, did they get more than they bargained for.